Along with the Guide, DOE and EPA have released online versions of the 2018 “Top Ten” and “Best and Worst in EPA Size Class” fuel economy lists. Like the online Guide, these online lists will be updated throughout 2018 as new data become available. · Enhanced Electronic Access: The 2018 Fuel Economy Guide will be published in a (paperless) electronic format only. The online Guide will be updated periodically to include newly released vehicle models and current fuel cost estimates. 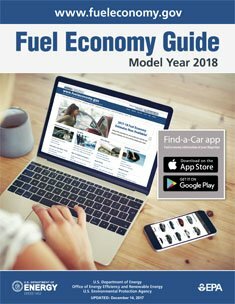 You can download the latest Fuel Economy Guide from the government’s fuel economy website and print copies from the electronic file as needed. You can also join our email list to receive notification when the new Guide is available each year. · Display Signage: Dealers, libraries, and credit unions can download and print a sign/poster to place in their display area directing customers to the Fuel Economy Guide.